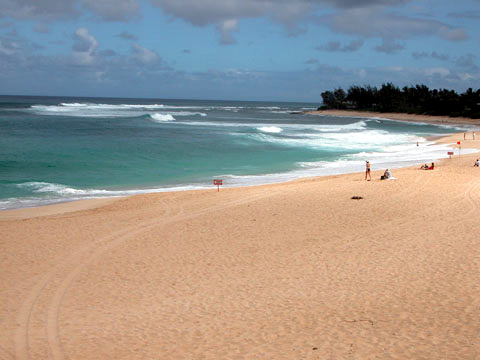 The name Sunset Beach emerged in the1920s when the undeveloped shore from Paumalu to Pupukea was subdivided into beach lots and offered for sale as the Pupukea-Paumalu Beach Tract. The two-mile tract included all of the beachfront property from Sunset Point to Pupukea Beach Park and was promoted as the Sunset Tract for the area’s spectacular sunsets. The name Sunset Beach evolved from the promotion. Sunset, the surf site, is at the east end of the beach and one of the most famous surfing spots in the world. Home to several internationally renowned contests, including the Triple Crown of Surfing since 1983, it was first surfed during the late 1940s when local surfers from Waikiki began exploring the rest of the island. In the 1950s Sunset was discovered by California surfers and featured in all of their early surfing movies, imprinting it permanently on the international surfing map. Sunset has some of the most spectacular winter surf found anywhere in the world. Outside peaks are mountainous, steep, and shifty, often reaching heights of twenty feet or more. Inside walls are thick, hollow, and powerful, often breaking bones and boards. Sunset is famous for its rip, the river-like current that flows into Kammieland, the next surf site to the west. The Sunset rip runs on every big swell and is the site of many rescues. Sunset Beach Park, the narrow, undeveloped 18-acre park between Sunset’s 200-foot-wide beach and Kamehameha Highway, has room only for roadside parking. To add facilities to the beach park, the City and County of Honolulu purchased two acres across the highway and built Sunset Beach Support Park in 1998 which includes restrooms, showers, and additional parking.